Developing functional Dynamic Interactive Nanosystems by tuned incorporation of biorelevant molecular components into nanoplatforms (nanoparticles, nanostructured surfaces, membranes, microarrays, etc.) in synergy with the self-construction of appropriate 3D nanoscaffolds. Understanding the dynamic self-organization of molecular components within functionalised nanoplatforms by exploring their synergistic adaptive behaviours and their structural evolution upon addition of different biological target molecules, and to control accurately the chemical/biological responses of Dynamic Interactive Nanosystems. Addressing challenges in the glycoscience field by inclusion of Dynamic Interactive Nanosystems as complex biomimetic platforms. Developing new applications of Dynamic Interactive Nanosystems in biomedicine and biotechnology, and investigating industrial applications for increasing the impact of developed bio- and environmentally responsive nanomaterials and "smart" nanodevices. 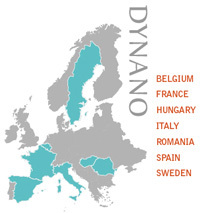 DYNANO's objectives address the research frontier of the highly competitive new targets for a variety of therapeutic and biotech applications with enormous clinical perspectives.